This seems even more sheer than the OPI Red Shatter, so know that any color you layer it over will show through the pink sections and possibly change the color. It seems to crackle nicely at least. OPI Pink Shatter is limited edition and was supposed to be available only through September and October, but when I was at Ulta last week, it was still around and likely will be until it sells out. Wow I really like those two looks! Thanks for the pictures, adding to my lust list now. I am so over the crackle thing.... haha. Time for OPI to make magnetic or something. A part of me wants this color but I don't know if I want it bad enough to get it. It's beautiful, but I really don't know if I like how sheer it is. Plus, the whole crackle thing is kind of getting annoying. I mean if this was some super unique color, maybe I'd get it. Beautiful swatches though. Trbobitch, yeah, me too! This was hard for me to review cause I just kept thinking... no, not another crackle! 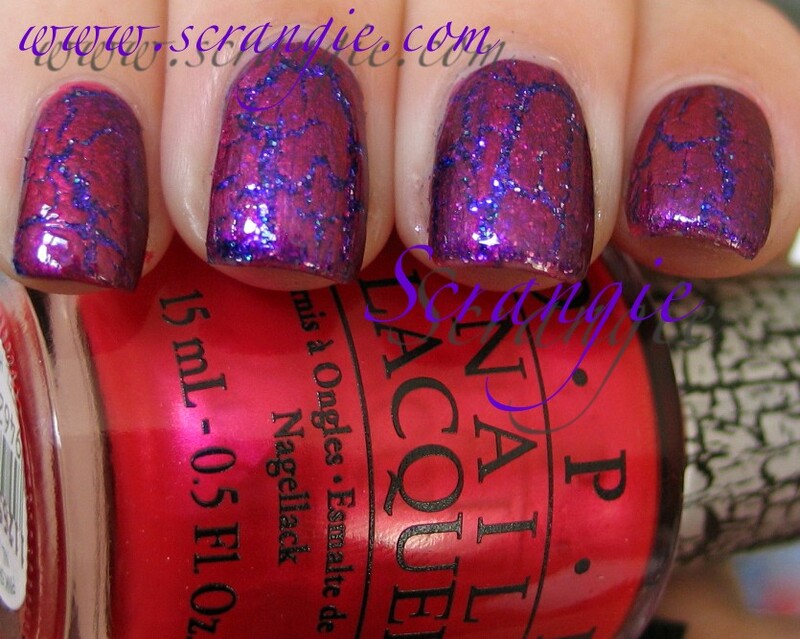 OPI Magnetics... now THAT I'd like to see! Melissa, honestly, since the proceeds from this aren't donated, I would save the money and get the pink crackle from Pure Ice for $2 if you're wanting a pink crackle. This seems too sheer to cost this much. I love the effort you put into swatching for us, Scrangie but... NOT ANOTHER CRACKLE. It's at the point where I think if I ignore them, maybe they'll go away. Then make a comeback in 10 years, since everything in cosmetics and fashion seems to be cyclical. Mimi, lol, that's exactly how I feel. I was REALLY excited when crackle first started coming back because I hadn't seen them since the terrible Cover Girl ones, but now I don't even want to think about seeing another one! It seems this style is really in fashion. I saw them all the time.